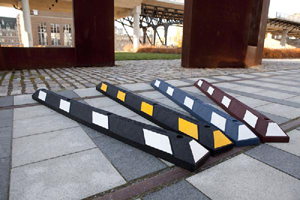 As an alternative to concrete parking bumpers, Indiana Barrier Company can also supply and install plastic and recycled rubber parking bumpers. These parking bumpers are easy to install and come in a variety of sizes and colors. For more detailed information about these products or to request a quote, please contact us at (317) 549-2900 or by email at sales@indianabarrier.com.